Called "The Endless City in Height," this gorgeous design does away with traditional stacking floors, replacing them with two street-sized ramps that rise and coil vertically into the London skyline. 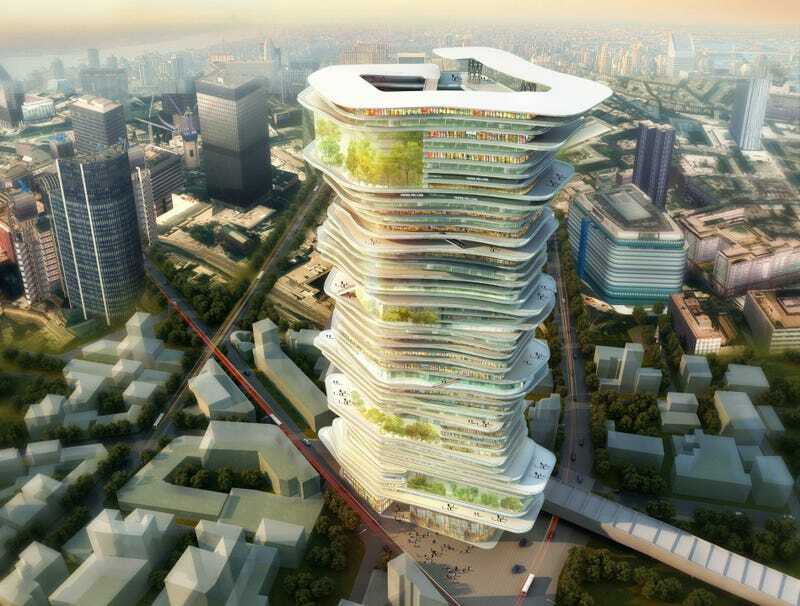 SURE Architecture recently took top prize at the Skyscrapers and SuperSkyscrapers Competition with this design. The building's pedestrian-friendly and intertwining ramps would be connected to each other by a series of bridges and walkways. Shops along the ramps would look just like they do on the ground, being free to customize their façade to match the aesthetics of the overarching design. Structural support would be provided by six steel tubes, which would also contain the plumbing and electrical work. In order to meet zoning requirements, the building would narrow at the base and spread its coiled streets outward at its crown. Sunlight could thus be centered on the tower and allow for extensive natural lighting.